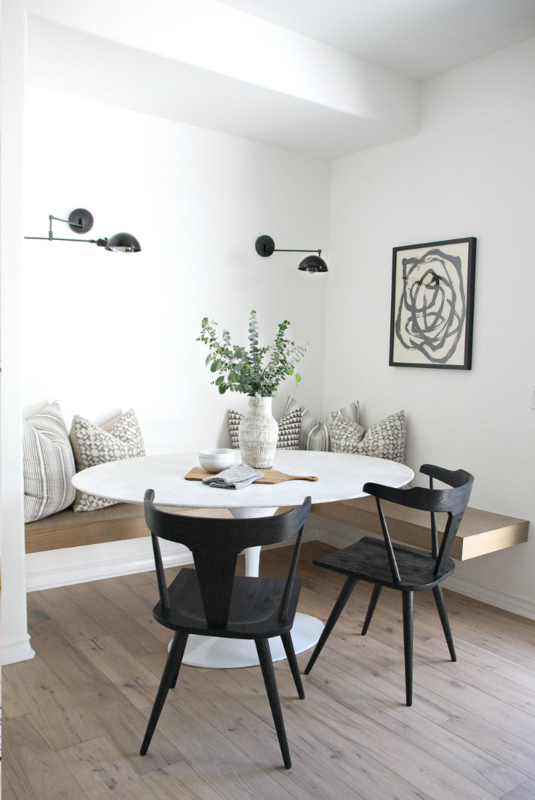 Breakfast nooks are smart on space and big on style! Whether you have a Hamptons style home, mid-Century or minimalist, we’ve rounded up the most beautiful breakfast nooks to inspire you. Perhaps you already have a breakfast nook that could do with a refresh? Or maybe you’re looking at incorporating a new breakfast nook into an unused space in your home? We hope you find some ideas to steal from this gallery of beautiful spaces! Showcasing how less is often more, we love this restrained breakfast nook with floating timber bench seat and pops of black. Those lights add an architectural feel and offer better task lighting than traditional downlights should you need to use the space to do desk work.